Canada is resisting efforts to curb international trade in asbestos, the building material that can cause cancer. The country, which prohibits its use, wants to continue to export the material to developing countries where it is still allowed. In the mining town of Asbestos, people are hoping for a revival of good times. A retired yellow dump truck stands at the edge of Asbestos, not far from a sign welcoming visitors to the Quebec town. 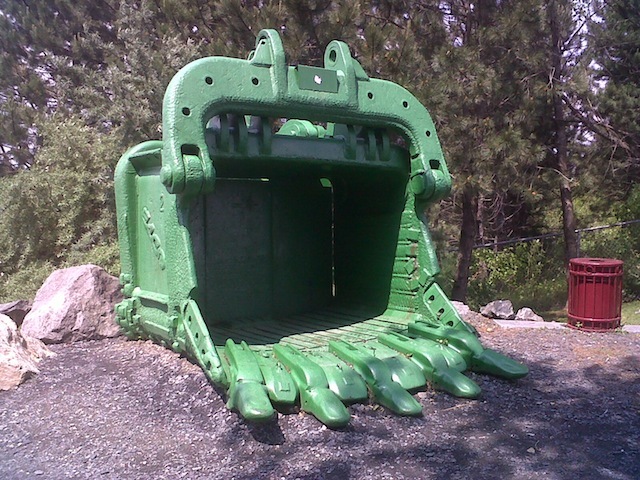 The monster equipment is a proud reminder of the industrial tradition of the town of about 7,000 people, named for the raw material that was mined here until recently from one of the largest open pit mines in the world. Among locals, that material is nicknamed l’or blanc, or white gold. But worldwide, asbestos is infamous as a carcinogen. Since the 1960s, the material has been discredited because inhalation of its fibers can cause deadly lung diseases, including cancer. Driving into Asbestos, it is hard to miss a gigantic crater, two kilometers in diameter and nearly 400 meters deep. For more than a century, this pit was a prime world source of asbestos – once hailed as a ‘magic mineral’ for construction purposes because of its strength and insulating properties. The open pit has been exhausted and production stopped in 2009. Now, investors are hoping to revive asbestos production in a nearby underground mine that has largely been built. The operator of the mine wants to extract 200,000 tonnes of so-called ‘white asbestos’, or chrysotile, per year. It’s a controversial plan because most Western countries have banned the use of asbestos. The backers of the plan want to export the material to developing countries where it is still being used, including India, Indonesia and Mexico. 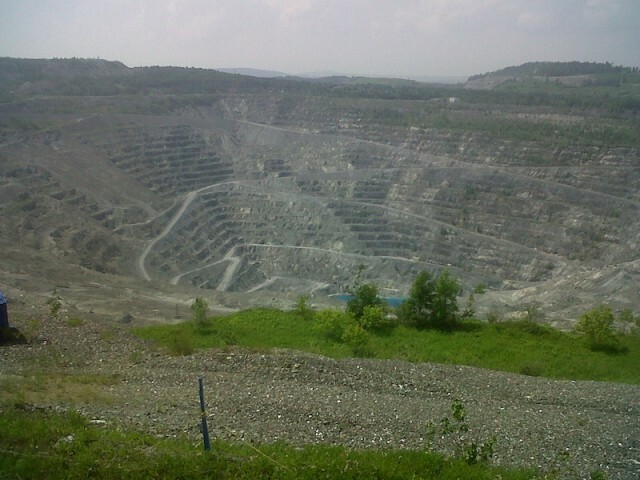 The large open mine in Asbestos, Quebec. The plan for the mine is also backed by the Canadian government – even though the use of asbestos is prohibited in Canada. Prime Minister Stephen Harper sees no problem in supplying it to countries without such a ban. “This government will not put Canadian industry in a position where it is discriminated against in a market where sale is permitted,” he has said. That position has drawn intense fire from opponents of asbestos. They say Canada is standing in the way of international efforts to curb the use of asbestos. Specifically, the country is blocking efforts to add chrysotile to the Rotterdam Convention, an international agreement on trade in hazardous chemicals. If chrysotile is added to the list, as is being debated this week at a UN conference in Geneva, it can only be traded with consent of the importing country. Importers must be fully informed of the substance’s hazards and on precautions that must be taken to handle it safely (see sidebar). Nonsense, say representatives of the asbestos industry. They say deadly applications of asbestos from the past, such as amphibole asbestos sprayed between walls for isolation, has long been abandoned. Chrysotile is now being used in a safe way by capturing it into other materials such as cement, they argue, so that fibers are not released into the air. Old mining equipment on display in Asbestos. Paradis spoke in the Parliament building in Canada’s capital Ottawa, which is undergoing renovations to remove asbestos that was sprayed between walls. That work is done by specialists in hazmat suits and oxygen masks. Activist Ruff thinks it is not realistic to assume that Canadian asbestos will be treated in a safe way in developing countries. Workers at a company in India that imports asbestos are reported to unpack the material with their bare hands, wearing handkerchiefs to their mouths. “That will kill a lot of them,” she says. Back in Asbestos, chrysotile is not viewed as a dangerous substance. It remains the popular export product that was once the pride of Quebec, but that is always used synonymously with more dangerous forms of asbestos. Countries that have signed the Rotterdam Convention on the Prior Informed Consent Procedure for Certain Hazardous Chemicals and Pesticides in International Trade are meeting this week in Geneva. Like at two previous conferences in 2006 and 2008, they will discuss whether to include ‘white asbestos’, or chrysotile, to the list of substances covered by the accord. When a substance is on the list, like certain pesticides and mercury compounds, exporting countries must provide information to the importing country about dangers of the material and proper measures to handle it responsibly. The importing country can choose to prohibit the material. The scientific Chemical Review Committee of the Convention has been recommending since 2006 to include chrysotile on the list. Chrysotile can cause fatal lung diseases, including lung cancer when fibers are inhaled. People who handle the raw material, such as construction workers, are particularly at risk if they do not take special precautions. According to the World Health Organization, more than 100,000 people die each year worldwide from the effects of exposure to asbestos fibers. More than 50 countries around the world have largely banned the use of asbestos.